High quality commercial printing and the development of cost effective marketing support materials are our specialties. We are a comprehensive marketing services organization working from concept, graphics design, copy writing, to final press work and printing. AAA Quality Services of Hawaii can handle all your company's needs, provide personalized service and guarantee your complete satisfaction... all on time and at the right price. Our expertise is producing high quality and effective marketing support materials with visual impact- on time and at competitive prices. For the past 26 years, AAA Quality Services founder Jan Lee has brought Hawaii a unique solution to the high cost and complexities of commercial business printing. Jan established and built her company based on customer satisfaction and has developed a highly qualified team of local and mainland creative and production resources that provide a competitive advantage in the marketplace. 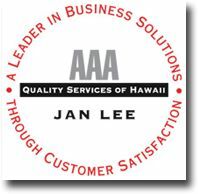 Jan Lee and AAA Quality Services have become respected leaders and valuable marketing partners within the community, servicing the comprehensive needs of the hotel Industry, small businesses and local sporting events.